St Patrick’s Catholic Primary School is situated on the outskirts of Mansfield. Its Mission statement: ‘Sharing, Caring and Belonging’ underpins the work of our close knit school parish communities. 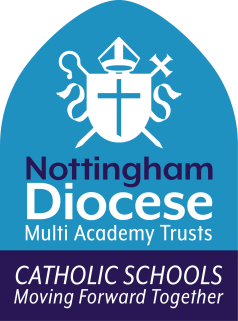 Our school has approximately 230 pupils, from Foundation 1 to Year 6 and serves the parishes of St Patrick’s, St George’s and St Joseph’s, Boughton. The school achieved a ‘Good’ overall grade in our latest Section 48 and OFSTED inspections (December 2013 and March 2017). We pride ourselves upon our strong relationships between all stakeholders. “Parents are highly supportive of the school. One described it as a ‘school that cares for the whole child, through its ethos and mission statement.” (OFSTED March 2017). Religious Education is at the heart of all we do and pupils are articulate and proud in expressing their faith. Parents and carers, families, Governors, pupils and staff work together to continually improve our learning. Pupils achieve consistently high in all Key Stage areas and show confidence, resilience and a deep sense of pride in their school as part of our school parish community. Our dedicated Governors and staff are passionate about providing a fun, diverse, broad curriculum for the development of the whole child. The school provides an enriched Arts, Music and Sports curriculum, with very active participants who are enthusiastic, happy learners. in expressing their faith. St Patrick’s provides a family environment for all where everyone is valued as a child from God and all are united in their love of God.